The law firm of Rice, Adams & Woodruff, located in Jacksonville, Arkansas, is a general civil law practice dedicated to providing quality legal service in an efficient and cost effective manner. 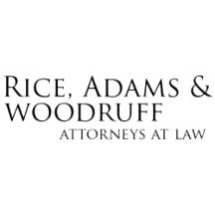 For over forty years Rice, Adams & Woodruff has earned a strong reputation in successfully representing individuals and their families in a broad range of legal matters. Our firm offers a unique combination of experience, skill and expertise that enables its attorneys to provide vigorous, effective and quality representation to clients. We believe our success reflects our commitment to excellence in litigation and our absolute willingness to take the extra step to ensure that our clients receive the highest quality representation.